Too often, we think like Saruman. It's time to think more like Gandalf. Or perhaps even more appropriately, it's time to act more like Bilbo Baggins. The Hobbit: An Unexpected Journey takes us on another J.R.R. Tolkein adventure. Over a decade ago, director Peter Jackson gave us the incredible story of The Lord of the Rings trilogy, Tolkein's masterpiece in cinematic form. This time, however, we go back farther into the history of Middle Earth, before the fellowship and the ring, when the object of the journey wasn't saving the world, but simply reclaiming one's home. As we begin this tale, we meet Gandalf again (Ian McKellen) encouraging young Bilbo Baggins (Martin Freeman) to accompany thirteen dwarfs on a epic adventure to the Lonely Mountain - the "Promised Land" of the dwarfs that had been overtaken by the dragon Smaug sixty years prior. The colorful collection of lost dwarfs is led by the great warrior Thorin Oakenshield (Richard Armitage), and they need a hobbit like Bilbo to sneak into places they cannot. 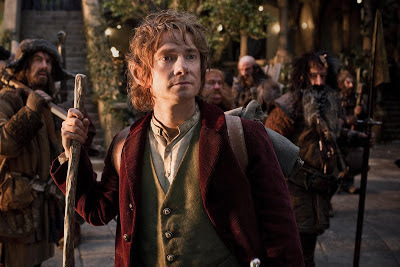 Bilbo doesn't seek this adventure, but he ultimately decides to join the dwarfs anyway - mostly because he takes pity on their homelessness (and for a hobbit like Baggins, having a comfortable home is a blessing all creatures should have). Despite thoroughly enjoying his comfort zone, Bilbo has a compassionate heart and generous spirit - one that Gandalf saw in him before he saw it himself. Of course, some on the high and mighty White Council doesn't share Gandalf's vision. This Council, you see, is made up of really important people like Gandalf and his fellow wizard Saruman (Christopher Lee), Elrond (Hugo Weaving), the elf lord of Rivendell, and the Lady Galadriel (Cate Blanchett), the mightiest and fairest of the elves in Middle Earth. In a private conversation with Galadriel, Gandalf confesses that he puts his faith in simple, ordinary people rather than in great powers like the White Council. "Saruman believes it is only great power that can hold evil in check, but that is not what I have found," declares Gandalf. "I found it is the small everyday deeds of ordinary folk that keep the darkness at bay: small acts of kindness and love." Whether it is facing off against the dragon Smaug, or the growing threat of the Necromancer, or any form of malevolent trolls, goblins, or orcs, Gandalf chooses to put his bets on those like Bilbo or the quietest of the dwarfs over wizards, elves, or kings. Too often, we think as Saruman does: we put our faith in seemingly important people to solve all our problems. We tend to put our bets on politicians, celebrities, corporate heads, media figures, and household names - locally or globally. We bet on them to fix our economy, eradicate crime and poverty, and bring peace and happiness to our worlds. And too often, they don't deliver. Perhaps it's time to think as Gandalf does: to put our faith in others and in the gifts God has given to us, rather than waiting for some greater power on earth to solve everything for us. As I write this, I am troubled by the recent tragedies of gun violence in Colorado, Oregon, and most recently, Connecticut. Yet in the midst of this darkness comes the story of "ordinary folk" like Vicki Soto who sacrificed her life so that others might live at Sandy Hook Elementary School in Newtown. People like Vicki "keep the darkness at bay" for she gives us an example of selflessness and love that we can all follow. She, and others like her, are truly lights in the darkness of such horror. We need to believe in people like Vicki Soto in our own lives. Who are the kind, loving, and compassionate souls we know - who get little recognition for the little things they do to make this world a better place? And how can we ourselves become more like Vicki, by being selfless in the face of violence, hatred, and darkness in our daily lives? Like Gandalf, God puts his faith in people like this. Even in the person of Jesus Christ, God trusted the salvation of humanity to a man who lived his whole life in poverty, who walked up and down unmarked roads of a forgotten Roman province, and who died the death of a forsaken criminal. The Father didn't trust in the great powers like kings, emperors, or high priests for the task of redemption - but in the simplicity and ordinary life of a Galilean peasant. And also like Gandalf, we grow frightened. But let people like Vicki Soto give us courage and strength. We may not be president, pope, or king, but that just means we have even more power to hold darkness at bay and to change the world. Let us pray for Christ to live in more "ordinary folk" like you and me and those in our everyday lives - and in so doing, let us pray for great things to happen because of these people!